Unfortunately, your registration has been declined by the auctioneer. You can contact the auctioneer on +44 (0)1392 413100 for more information. You are the current highest bidder! To be sure to win, log in for the live auction broadcast on 06 Mar 2019 12:30 GMT or increase your max bid. 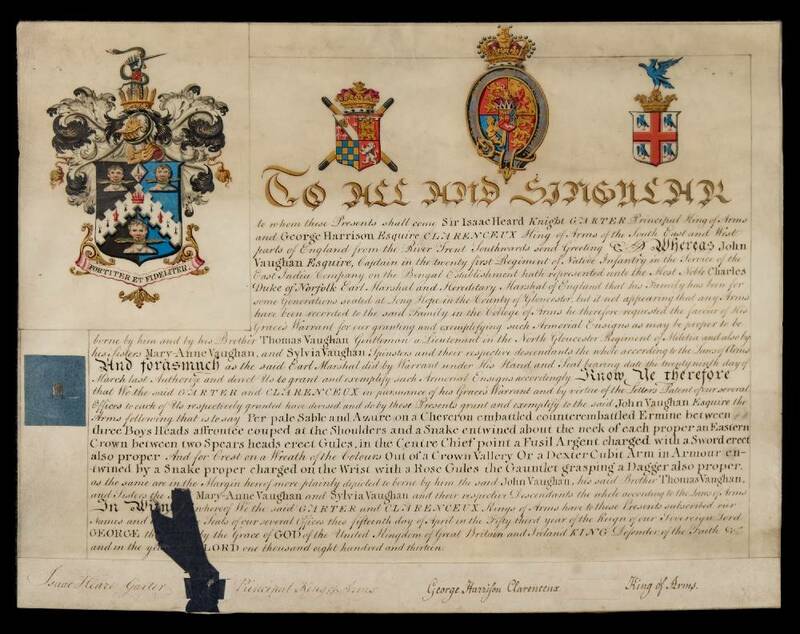 GRANT OF ARMS : to John Vaughan, Captain in the 21st Native Infantry in the service of the East India Company in Bengal .... manuscript on vellum with hand painted coats of arms, 1813. Preferential rates have been negotiated with Mail Boxes Etc who are specialists in the provision of wrapping, packing and despatch services to the antiques and fine art business sector. They can provide you with all the necessary services for lots purchased from our salerooms. We are unable to provide any other wrapping, packing or despatch service. Mail Boxes Etc collect items regularly from our salerooms. Special collections can be arranged, if required. They offer a professional, domestic and international service by post, courier, road, air and sea, depending on the lot size, destination and speed required. Bespoke cases can also be made up for your lot or lots. While indicative pricing is always obtainable by contacting Mail Boxes Etc, firm pricing is agreed after wrapping and packing prior to despatch. The minimum charge made by Mail Boxes Etc is £15.00 plus VAT for small, lightweight, non-fragile items under 2Kg. This includes collection, professional wrapping, packing and domestic delivery. Payment can be made with all major credit and debit cards. If you do not have your own transit insurance, enhanced compensation cover is available from Mail Boxes Etc, either for full cover or loss only, as required. Unfortunately Bearnes Hampton and Littlewood do not offer shipping and are unable to provide any other wrapping, packing and despatch service of their own. Competitive rates have been negotiated with Mail Boxes Etc., specialist in the provision of wrapping, packing and despatch services to the Antiques and Fine Art business sector. They provide for all services for lots purchased from our saleroom. Mail Boxes Etc. collect items weekly from our saleroom, though special collections can be arranged if required. They offer a professional, domestic and International service by post, courier, road, air and sea, depending onthe lot size, destination and speed required. Bespoke cases can also be made up for your lot or lots. While indicative pricing is always obtainable by contacting Mail Boxes Etc., firm pricing is agreed after wrapping and packing prior to despatch. 4. Buyer’s Premium. The Conditions of Sale oblige buyers to pay a buyer’s premium at 25.2% which shall include VAT on the premium at the rate imposed by law (see below), except for books which are exempt from VAT. Please note: Lots purchased online with www.the-saleroom.com will attract an additional charge for this service in the sum of 4.95% of the hammer price plus VAT at the rate imposed. 5. VAT. A ‘dagger’ symbol indicates that VAT is payable by the purchaser at the standard rate (presently 20%) on the hammer price as well as being an element in the buyer’s premium. This imposition of VAT is likely to be because the seller is registered for VAT within the European Union and is not operating the Dealers Margin Scheme or because VAT is due at 20% on importation into the UK. The double ‘dagger’ symbol indicates that the lot has been imported from outside the European Union and the present position is that these lots are liable to a reduced rate of VAT (5%) on the gross lot price (i.e. both the hammer price and the buyer’s premium). Lots which appear without either of the above symbols indicate that no VAT is payable on the hammer price. This is because such lots are sold using the Auctioneers’ Margin Scheme and it should be noted that the VAT included within the Premium is not recoverable as input tax. 6. We are, primarily, agents for the seller. We are dependent on information provided by the seller and whilst we may inspect lots and act reasonably in taking a general view about them we are normally unable to carry out a detailed or any examination of lots in order to ascertain their condition in the way in which it would be wise for a buyer to do. Intending buyers have ample opportunity for inspection of goods and, therefore, accept responsibility for inspecting and investigating lots in which they may be interested. Please note carefully the exclusion of liability for the condition of lots contained in the Conditions of Sale. Neither the seller nor we, as the auctioneers, accept any responsibility for their condition. In particular, mechanical objects of any age are not guaranteed to be in working order. However, in so far as we have examined the goods and make a representation about their condition, we shall be liable for any defect which that examination ought to have revealed to the auctioneer but which would not have been revealed to the buyer had the buyer examined the goods. Additionally, in specified circumstances lots misdescribed because they are ‘deliberate forgeries’ may be returned and repayment made. There is a 3 week time limit. (The expression ‘deliberate forgery’ is defined in our Conditions of Sale). 7. Electrical goods. These are sold as ‘antiques’ only and if bought for use must be checked over for compliance with safety regulations by a qualified electrician first. The export of any lot from the UK or import into any other country may be subject to one or more export or import licences being granted. It is the buyers responsibility to obtain any relevant export or import licence. The denial of any licence required or delay in obtaining such licence cannot justify the cancellation of the sale or any delay in making payment of the total amount due. 9. Bidding. If you wish to bid at this auction you will need to register and provide proof of identity and of your address and provide photographic I.D. You will be invoiced to the name and address on the registration form. You may be asked to pay a deposit of £5,000 and this applies to online bidding, commission bidding, telephone bidding and bidding in person. Any deposit must be paid by electronic bank transfer. Bearnes Hampton & Littlewood must have cleared funds no later than 12 noon GMT, the day prior to the auction. If you are not successful you will be refunded (without interest) within seven working days. All telephone bids must be booked by 4.30pm on the day prior to the auction. 10. Commission bidding. Commission bids may be left with the auctioneers indicating the maximum amount to be bid excluding buyers’ premium. They will be executed as cheaply as possible having regard to the reserve (if any) and competing bids. If two buyers submit identical commission bids the auctioneers may prefer the first bid received. Please enquire in advance about our arrangements for the leaving of commission bids by telephone. 11. Methods of Payment. If a purchaser is unknown to the auctioneers and is intending to pay by credit or debit card we will require the card holder to attend in person with suitable photographic identification, otherwise payment is required by electronic bank transfer. As a general rule any cheques tendered will need to be cleared before removal of the goods is permitted. Please discuss with our office in advance of the sale if other methods of payment are envisaged. CASH (up to a sterling equivalent of the EU limit) CHEQUE; STERLING BANK DRAFT; ELECTRONIC BANK TRANSFER IN STERLING; CREDIT CARD (VISA AND MASTERCARD ISSUED IN THE UK ONLY); DEBIT CARDS (SWITCH, CONNECT, ETC) Cheques and drafts should be made payable to Bearnes, Hampton & Littlewood . Please note what the Conditions of Sale state about collection and storage. It is important that goods are paid for and collected promptly. Any delay may involve the buyer in paying storage charges. ELECTRONIC BANK TRANSFERS should be made to: National Westminster Bank, 59 High Street, Exeter. EX4 3DP. For all the account of Bearnes, Hampton & Littlewood. If a purchaser is unknown to the auctioneers and is intending to pay by credit or debit card we will require the card holder to attend in person with suitable photographic identification, otherwise payment is required by electronic bank transfer. As a general rule any cheques tendered will need to be cleared before removal of the goods is permitted. Please discuss with our office in advance of the sale if other methods of payment are envisaged. Sterling cheques drawn on UK banks and supported by a cheque card valid for the amount due can be cleared immediately. All other sterling cheques drawn on UK banks will generally clear on the fifth working day after receipt. Sterling bank drafts drawn on UK banks can generally be cleared immediately. Bank transfers clear as soon as our bank receives funds (which does not happen instantaneously after payment instructions are given). Credit and debit card payments can be cleared immediately, subject to confirmation with the card issuer. address on the registration form. Bearnes, Hampton & Littlewood carries on business with bidders, buyers and all those present in the auction room prior to or in connection with a sale on the following General Conditions and on such other terms, conditions and notices as may be referred to herein. 3. INCREMENTS Bidding increments shall be at the auctioneer’s sole discretion. 4. THE PURCHASE PRICE The buyer shall pay the hammer price together with a premium thereafter per lot of 21% + VAT (25.2%) Please note: Lots purchased online with www.the-saleroom.com will attract an additional charge for this service in the sum of 4.95% of the hammer price plus VAT at the rate imposed. S. VALUE ADDED TAX Value Added Tax on the hammer price is imposed by law on all items affixed with a ‘dagger’ or double ‘dagger’. Value Added Tax is charged at the appropriate rate prevailing by law at the date of sale and is payable by buyers of relevant lots. (Please refer to “Information for Buyers” for a brief explanation of the VAT position). (e) to charge interest at a rate not exceeding 1.5% per month on the total amount due to the extent it remains unpaid for more than 3 working days after the sale; please note there will be an additional late payment penalty of £40 if your account is unpaid after 28 days. 9. THIRD PARTY LIABILITY All members of the public on our premises are there at their own risk and must note the lay-out of the accommodation and security arrangements. Accordingly neither the auctioneer nor our employees or agents shall incur liability for death or personal injury (except as required by law by reason of our negligence) or similarly for the safety of the property of persons visiting prior to or at a sale. 10. COMMISSION BIDS Whilst prospective buyers are strongly advised to attend the auction and are always responsible for any decision to bid for a particular Lot and shall be assumed to have carefully inspected and satisfied themselves as to its condition we will if so instructed clearly and in writing execute bids on their behalf. Neither the auctioneer nor our employees or agents shall be responsible for any failure to do so save where such failure is unreasonable. Where two or more commission bids at the same level are recorded we reserve the right in our absolute discretion to prefer the first bid so made. 11. WARRANTY OF TITLE AND AVAILABILITY The seller warrants to the auctioneer and you that the seller is the true owner of the property consigned or is properly authorised by the true owner to consign it for sale and is able to transfer good and marketable title to the property free from any third party claims. 13. TERMS OF SALE The seller acknowledges that Lots are sold subject to the stipulations of these Conditions in their entirety and on the Terms of Consignment as notified to the consignor at the time of the entry of the lot. (2) you personally are not able to transfer a good and marketable title to us, you shall have no rights under this condition. The right of return provided by this Condition is additional to any right or remedy provided by law or by these Conditions of Sale. (2) Such rights and exclusions shall extend to and be deemed to be for the benefit of employees and agents of the seller and/or the auctioneer who may themselves enforce them. 18. Any notice to any buyer, seller, bidder or viewer may be given by first class mail or Swiftmail in which case it shall be deemed to have been received by the addressee 48 hours after posting.